It’s been fairly slow fishing in Marine Area 7 for Chinook. There have been some fish coming through but it’s hit and miss, with not a lot of nets flying. However, we may see better fishing anytime so it’s still worth a shot. You never know when you might hit ’em dead on! Submitted by Kevin Klein, Team Parker Boats NW. The cover image of this week’s reports, featuring Karen Rhinehart, was also contributed by Kevin. Area 9 being closed to Boat fishing, anglers have crowded the few beach accesses. 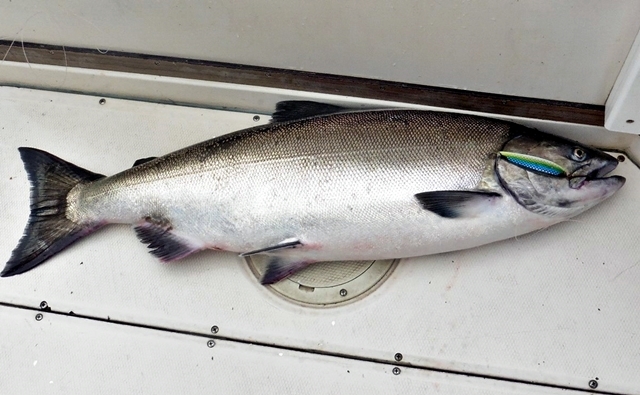 Coho are being caught on a variety of set-ups. Small spoons, Buzz Bombs and Herring under floats seem to be used by most anglers. As usual a few anglers who don’t read the regulations are out fishing from their boats in plain sight at Point No Point. A great Area 10 report from the Moser brothers! Bryce lowered his Cop Car 3.0 Tailwagger to the bottom on the Scotty and just a few minutes later the fight was on. He gently uncorked the rod from the holder and reeled like he had never reeled before. It did not take long and they netted a nice one while fishing with their dad near the oil docks off Edmonds in 140 feet of water in the dirt. Now it is COHO time for the brothers! Report submitted by Nelson “Spud” Goodsell – Salmon for Soldiers, IGFA Life Member, FISHTALE2. The Chinook salmon fishing has been fair to good since Friday last week however it has slowed a little bit this morning but being this time of year it should pick right back up anytime the bulk of the chinook are being caught along the Gig Harbor shoreline in about 40′ to 80′ of water early in the morning or late in the evening, fishermen are also catching fish at the Clay banks, Dalco area and from the Slag area to Owen Beach some of these fish are suspended as well but if you see fish on your depth finder near bottom then get your gear there. 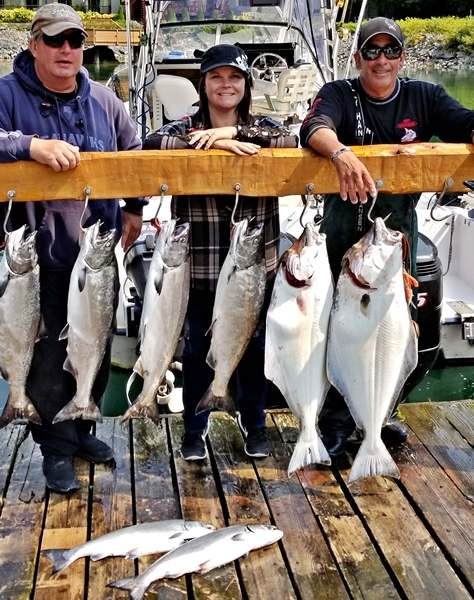 The Coho fishing is still decent small fish from 3lbs to 5lbs are being caught along the kelp beds or out in deeper water from 30′ to 60′ deep and in the usual spots you find Chinook. Pink salmon are being caught along the shore line outside of Quartermaster Harbor, Dash Pt., Browns PT., Puyallup River Mouth and Gig Harbor shoreline and also trolling deeper water from 30′ to 60′ of water. 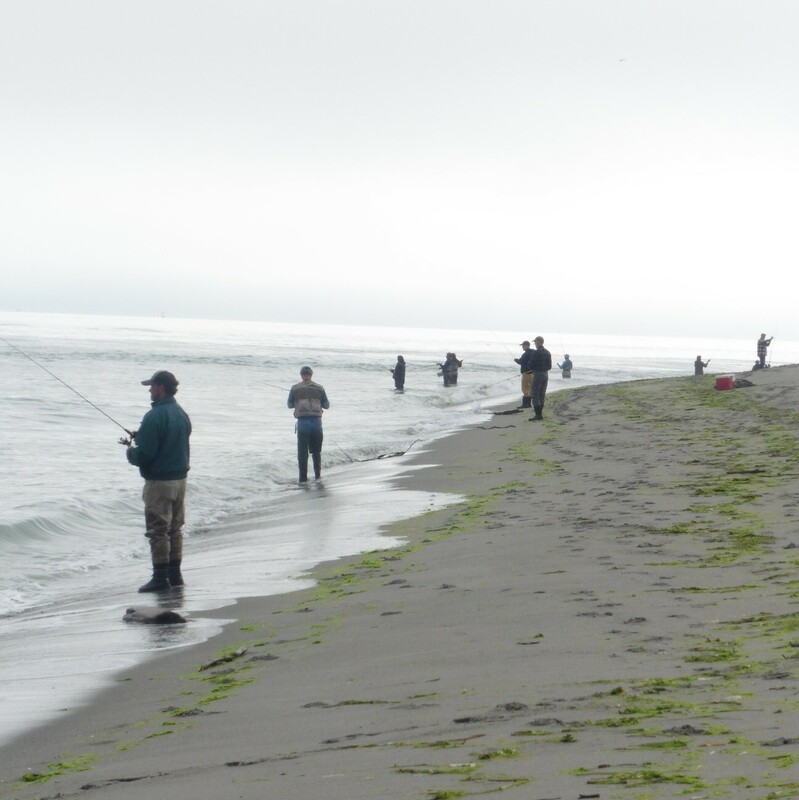 Dungeness crabbing remains slow overall with a few being caught in waters to 150′ or more. For an updated report call (253)591-5325. Point Defiance Marina has rental boats and motors and launch and overnight moorage facilities with pump out stations and shore power. In addition, we have storage space for boats up to 17 feet as well as kayak storage. For more information call 253-591-5325. Report submitted by Point Defiance Marina. For more information contact: Art Tachell, Boathouse Marina Technician, 253.591.5325 art@tacomaparks.com www.pointdefiancemarina.com. Finally we are seeing temperatures in comfortable ranges meaning in the 70s and not in the 100s. Also, blue skies have returned. Linda and I loaded the boat for a day in the dunes. After everything was set I went to start the truck. A new first with a dead battery. No problem, as I have two jump boxes. They were dead also so all three went on the chargers. While waiting I washed, both in and outside. Once done it was time for lunch. Now everything was charged and ready to go. We ran to the face of the dunes to see just how much water has been dumped out of Potholes. I know the trail back in the dunes starting by the whale bones. A good trail I have on my GPS led me back in to one of my spots that is now just becoming uncovered. I put Linda and our dog Betty on a dune with a chair and an umbrella for comfort. I motored about 100 feet to my spot. Rigged with a drop shot I landed and released 32 Largemouth Bass in two hours or less. I wanted to test another spot on the main lake for Walleye. All we could find was bullhead catfish. Returned as fast as possible to the water. Not Linda’s favorite. I saw no fishermen at the State Park ramp but water sports users. Temperatures and smoke have kept people away. Now we are seeing comfortable temperatures and the smoke has gone away for a while. A good time to come over. Donut peaches are now in season. Dan and Debbie from Shoreline with their guide Dan Brunet and a Canadian Daily Catch Limit. To say the fish report from Barkley Sound was good would be an understatement! Most days both off shore and in the sound, anglers limited on Chinook, Coho and Halibut. Coho were sometimes so thick they were hooked while your bait was still on the surface. Most Chinook and Coho were caught in the top 70’ of water. While a number of different lures were used, two of the best set-ups were the Silver Horde Herring Aide fished behind a Pro Troll Flasher and an anchovy in a bait holder behind a flasher. Halibut were caught mostly on the off-shore banks at depths from 200 – 300 feet deep. The excellent angling for both guided and private boats plus the gourmet meals, excellent care and sharing of information at Eagle Nook Lodge made for a great trip. We are certainly looking forward to next years trip. If you are looking to fill the freezer yet this year, call Dan Brunet at Eagle Nook/Lucky Sportfishing (250) 880-0636 and see if he has a cancellation or availability before the weather turns. A nice beefy Chinook caught with the Silver Horde Herring Aide hookup. Salmon fishing was FAIR this past week when it wasn’t blowing too hard. Most of the springs were coming in from Aldridge Point to Beechey Head. The pink run was a little slow this past week but some large ones were caught. The best depths to fish have been from 40 to 70 feet. Anchovies are now the most popular bait. Good teaser heads have been the Bloody Nose and Mint Pearl. Trolling Skinny G spoons on a 36” leader has been working great. The best color combinations being Nickel/Blue, Outfitters and No Bananas. For flashers, the Homeland Security, red/silver Hot Spot and Betsey have been working well. Anglers casting off the rocks are also getting into some nice fish. Cheanuh Marina once more has rental boats available for non boat owners. Salmon fishing was VERY SLOW in Oak Bay this past week. There were very few salmon coming in from the flats and the Gap. Anglers jigging have been catching more and larger salmon than those trolling. Good jigging lures have been 2¼ oz Point Wilson Darts, Deep Stingers and the Delta Mac Fish. The salmon are feeding on needlefish and have been at depths from 70 to 135 feet, depending on where the feed is located. Most of the anglers have been either bottom bouncing or jigging close to the bottom. Halibut fishing was SLOW this past weekend on the big tides and it was way too windy as well for most boats. Most anglers that were fishing for halibut are using extra large herring, salmon bellies and/or octopus for bait. Also working well was the 8” Powerbait Grubs and Delta Hali Hawgs. Pedder Bay Marina reports ON & OFF salmon fishing. The most productive area for trollers has been near the can buoy at the mouth of the bay and along the kelp beds. Trollers are doing best trolling from 30 – 70 feet on the downrigger and/or just off the bottom inside the bay. The area from Church Rock to the Bedfords picked up as well. Jiggers were doing better than the trollers and have been fishing near the Race. Anchovies are now the most popular bait for trollers. Good teaser heads have been the Bloody Nose and Mint Pearl. Spoons are also producing well, especially the smaller ones around 3.5”. Needlefish spoons worked the best with Skinny G’s, Left Coast Hammers, AP Tackleworks needlefish and Coho Killers the ones to use. Hootchies and squirts with a green and glow, or UV white have been popular color choices this week. Flashers that are popular include the Hot Spot Silver Fever, Bon Chovy and Betsey. The Juan de Fuca Fishing Tournament was held this past weekend and Pedder Bay Marina was weigh in central. First place in the derby went to Shawn Davies for a 30.35 lb chinook. Second place went to Butch MacPherson for a 28 .30 lb chinook. Third place, as well as the largest salmon caught by a lady, went to Michele Thomson for a 25.80 lb chinook. The largest hatchery salmon caught was a 24.95 lb chinook caught by Garrett Boe. 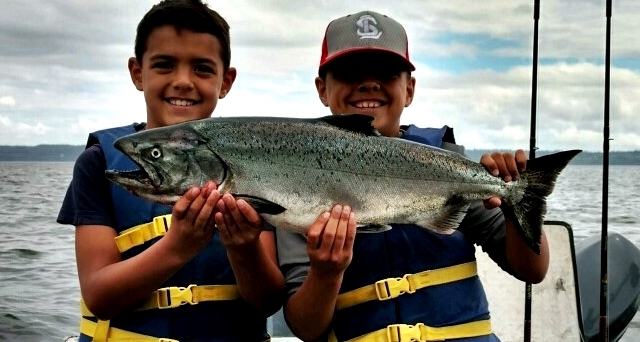 The largest salmon caught by a junior angler was an 18.40 lb chinook caught by Jaydon Hutchinson. The largest halibut prize went to Mike Koff for a 45.10 lb halibut. Halibut fishing was FAIR this past week. Most anglers that were fishing for halibut are using extra large herring, salmon bellies and/or octopus for bait. Also working well are the 8” Powerbait Grubs and Delta Hali Hawgs. Greg Baynton got this chunky 10 lb chinook off the south end of Moresby Island. Salmon fishing was SPOTTY in the Sidney area. There have been a few fish coming from the Sidney Channel, Hambley Point and Fairfax. Mccallum Frame caught a 21 pound chinook salmon on Sunday on a watermelon Rhys Davis teaser head and a Madi flasher at 80 feet just off of Hambley point. We did hear that there were some large pink salmon off Pender Island at 90 feet and they were only hitting anchovies. There were also some springs running much deeper at 150-180 feet off Pender. Anglers jigging were consistently catching springs. Good jigging lures have been 2¼ oz Point Wilson Darts, GIBBS Minnows and the Delta Mac Fish. Anglers using spoons found Coho Killers, Gibbs Needle G and AP Tackleworks needlefish spoons the most productive spoons this past week. Suggested colours are Trap Shack and Bon Chovy. Anchovies and Tiny Strip were also good producers of fish with teaser heads in UV Purple. The salmon fishing was SLOW over most of last week but there was a good bite Sunday afternoon. Otter Point to Muir Creek has been good for springs. Most anglers fishing for springs are using bait with anchovies being the most popular choice. Fishing shallow and close to shore has been the key to catching the larger fish. The pink salmon fishing was best in the 400+ foot depths. The pinks have been as large as 8-9 lbs. Anchovies have been the best bait. Good choices for teaser head colors are red, chartreuse and Bloody Nose. For flashers, the Delta Homeland Security, Gold Fever Hot Spot and Betsey have been working well. Hootchies in White, Glow/Green and Purple Haze have been caught some fish. Use small pink hootchies if targeting the pink salmon. Spoons have also been catching salmon and Coho Killers and Skinny s. G’s have been good in No Bananas and Outfitters colors. Fishing for salmon was SPOTTY off Victoria this past week. The most productive area was Constance Bank early in the week and along the waterfront on the weekend. The area from Brotchie to Trial Island produced some fish. Most boats fishing the waterfront came up empty. Some pink salmon are also starting to be caught offshore. Spoons have been very successful in getting hook ups, Nickel/Blue Skinny G’s and Blue/Silver Coyotes, Coho Killers, 3.5” Cop Car spoons have brought some hookups. The Clover Point Anglers’ Association held their 23rd Annual Salmon Derby at Clover Point on the weekend. In spite of very rough conditions there was a good turnout and some nice salmon were caught. First prize winner was Tom Celuszak with a 20 lb chinook. Second place went to Lance Foreman with a 17 lb 2 oz chinook. Finishing third was Tom Vaida with a 16 lb 15 oz chinook. Fishing was FAIR in most lakes for trout and GOOD for bass. No changes from previous reports. How- When you find them stay on them. The fishing is improving. We are finding pockets of colder water and schools of baitfish in 100 to 180 feet of water. When you pick up a fish head back over that area as you will likely find more action in that spot. Chinook numbers were up the last two days with some large Lake Trout also active on the bottom. We have good days and difficult days. Chinooks went for Magnum Reaper spoons in blue/silver or green/silver. White or green Howie’s flies also working well run behind a white flasher. The big 20 pounds plus Chinooks are more frequent part of the catch. We had some excellent days fishing them in the warm water with spoons or flies. Downriggers on the bottom with size 0 dodgers and Spin n Glows are taking the Lakers. Reapers and Vulcans have been working for us. The small silver Vulcan in green or blue has also been good on the lead cores for exciting Rainbows. I hope this helps. Slide Diver are producing with #3 silver J plugs set at 2 with small ring. Run them 70 feet of line out 70 behind the diver . Lake Trout action was somewhat improved all week on magnum spoons on the bottom. Brown Trout action was just ok on the bottom small spoons. One here and there. Rainbow Trout were hitting Vulcan Dolphin Green and Silver spoons in the top 40 feet. Speed- For all fish speed has been very critical with the warmer 68 degree water. The temp break to 55 is down 100 feet. I use the Depth Raider to measure speed and temp at the ball. The boat speed of 2.0 to 2.2 has been best. The faster speed triggered the Chinook action. Where- I fished anywhere from 100 to out over 180 feet. Follow the temperatures and fish the zone. Near shore action on McKinley pier has been very slow with only a few Browns being caught. Head north in Whitefish Bay and set lines in 100 feet. Troll north east have a great fishing season.